Toddler hooded long sleeve rasher. 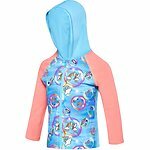 My daughter loves it, really comfy, light even when wet, great for sun protection!! !